Since Manuel Yamir Prieto Wieck graduated in BSc (Hons) International Tourism Management from Plymouth in 2005, he has been enjoying travelling around the world, surfing at every opportunity, while working on setting up his own surf company. 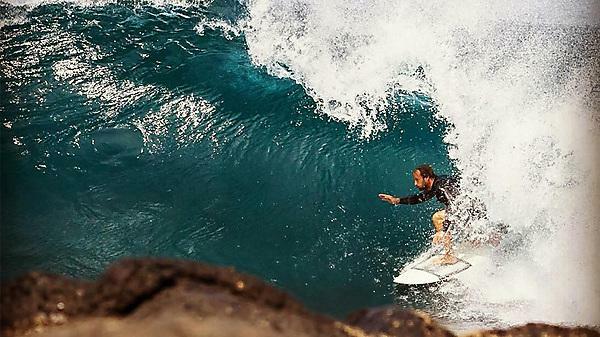 Yamir is now CEO of Planet Surf Camps, based in the Canary Islands. I chose Plymouth because it was close to the surf. I always wanted to study in either England or Australia, but Australia was too expensive. England was a good chance to study in English and have surf as well, so that’s why I chose Plymouth. Studying at Plymouth didn’t really change my career aspirations or plans, it helped me to prepare for them. I learnt how to work independently, how to work in groups, how to find information for myself. Speaking in front of people, doing essays, the placement – it really helps you for the future, for any job, if you know how to talk in front of people and work for yourself. I took the course seriously, I really went to university to study – I spent a lot of time in the library and doing group work. I recommend Plymouth, because I had a very good life there. It was a good mixture of hanging out with English people and the international community, which was nice. Being able to surf, the surf club, and all the extracurricular activities available, were great. I had some very good teachers too. I really enjoyed my time at Plymouth. I was an international student, but I got used to living in England because I had been in Australia before doing an English course. Once I was at Plymouth there were many international students, plus my English flatmates and the other students in the classes, as well as the teachers, who were all super helpful. The teachers would always help you and support you. It was great! I was actually one of the last students at the Newton Abbot campus, which was pretty fun because we had to walk through the cow and pig farm to get from where we were living, to our faculty. When I was in Plymouth, I really loved the parties they were doing in the Student’s Union. You don’t get that in many other countries. I did one year in Spain as well and I’ve seen German universities and you don’t get those great parties at the student union. I think it’s super well-organised. I did a placement, which was actually being the manager of my brother, who was competing at the time in the bodyboard world championships. I found my brother a few sponsors and some money to support the trip that we did to different competitions around the world. The placement really helped me, because I could observe working for a company. It was great, because instead of having someone to tell me what I had to do during my placement, I was there by myself. I had to find solutions and sponsors. I had to make phone calls and send emails. I was kind of working for myself, which maybe helped me to become my own boss. I am now working for a company, but it’s the company that I created. Although it has a different name to when I started it, I still do everything there. After I left Plymouth I travelled a lot, surfing and enjoying the world. I also worked to create my own company, which was called Wave Experience. I later sold Wave Experience to a bigger investor called Planet Surf. Now I handle everything at Planet Surf. I definitely wouldn’t have done anything differently work-wise, since graduating. Things have progressed at a good pace, allowing me to balance my work with ensuring I still have a good life as well – that’s the bright side of having your own company! The best part of my career is balancing the ups and downs of the job, such as finding a lot of good friends, but losing friends to work, as well. It’s hard to find out how to treat people, but you do find out and then try to be a good boss, which is fun. Seeing how you evolve yourself as a boss and a friend at the same time is a highlight too. It’s hard, but it’s fun and exciting. I’ve also had lots of good times at the camps, and a lot of fun surfing and travelling together with people from my team. Make a difference in the world's fastest growing industry and ensure tourists' dreams come true by working with destination managers. Develop your knowledge at a university consistently ranked as one of the best for studying tourism by the Sunday Times and the Guardian. Gain experience and vital business management skills and have the chance to learn new, or boost existing, foreign language skills by visiting a wide range of locations to improve your international career prospects.